Does Natural Hair Make You "Blacker?" Can you be “blacker” if you're already black — and “blacker” than who? We decided to get to the bottom of the controversy and add our own opinion to the conversation. Trying to define blackness is like trying to define love; it's different for every single person and produces unique experiences that can rarely be duplicated. Of course, like love, blackness means something different depending on who you ask. For some, blackness reflects someone's interests, clothing or the way they talk. For others, it may have more to do with deeper qualities, such as a knowledge of black history or having and displaying cultural pride. Historically, natural hair has been used as a source of black pride and resistance to assimilation. The Afro in particular had social and political connotations that reflected the “black and proud” sentiment of the time. Since then, however, the decision to go natural has become popular for all kinds of reasons and has even become a national trend devoid of political implications. Wearing your hair naturally may make your more confident or more conscious of your native texture, but does natural hair make you “blacker?” The short answer is no. Sometimes harsh words fly back and forth between the natural hair community and those who wear weaves or get their hair chemically-straightened. But one thing everyone has to remember is that our hair does not define us — it simply reveals our sense in style and fashion much the same those killer heels do! Rocking your natural hair and want to give your confidence a boost? Use your naturally curly hair to your confidence advantage! Choosing to wear your hair naturally says as much about you as your shirt does. 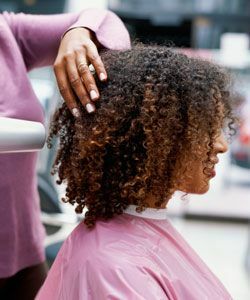 Some go natural because they want healthier hair, some because they want to save time or money, and others because they simply like the way it looks. Wearing your hair natural doesn't make you blacker, it just shows you're up for the adventure of loving yourself the way you were made: naturally curly.